Increasingly disappointed as the series continues. 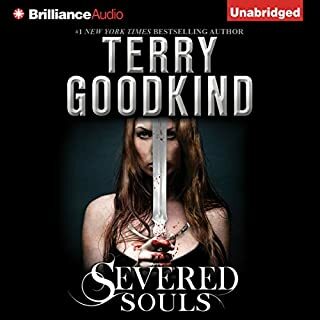 I've seen this in so many reviews of his recent books that it almost doesn't seem worth repeating, but if there are enough of them perhaps Mr. Goodkind and his publishers will take notice..... I was a huge fan of the original "Sword of Truth" series, and although there were signs of the following problems as early as "The Pillars of Creation" I felt the series got back on track, and really enjoyed it to its end ("Confessor"). Throughout the series, there was enough great story, description, dialogue and complex concepts to keep me buying the next book without any hesitation at all. However, as others have pointed out, his last few books increasingly feel like portions of a complete book padded out to make a full-sized novel. The amount of story and character evolution they contain seems small enough to have been told in a quarter to a third of the space, while the rest is taken up with laborious repetition of things we already know, and indeed in many cases have just been told (a couple of times). Just to be clear, I have no problem with a sequence being drawn out if it's necessary to the book. There were many instances in the first six novels (e.g. Richard's time with the Mord-Sith in the first, or his time in the Old World in the sixth) when it was required to make certain changes in a character's opinions or mindset plausible. It can be incredibly powerful and very subtle when it's done well, and the author does so brilliantly in those books. But increasingly in Mr. Goodkind's novels, it's as if the author and his characters don't believe it's sufficient to provide information once; he or she has to repeat it at least once, and then another character says it again, and so on and so on. I'm not sure if this is because the reader is assumed to have a low IQ or memory issues, or because no editor was used (or their recommendations were largely ignored), or (though I can't really believe this) simply to fill more space. On that note: it seems mandatory these days for fantasy authors - perhaps all authors - to have at least one new book out each year. Perhaps publishers and authors fear losing their fans if they 'fail' in this. Personally, I would much prefer to wait four years for another book if the aforementioned problems go away. I bought this audio book because I love the narration by Sam Tsoutsouvas (which is excellent as always), but unlike the previous books I won't be purchasing a hardback copy as well, and sadly I will probably think hard before purchasing the next book in any form. Great third entry, and narration terrific as ever. 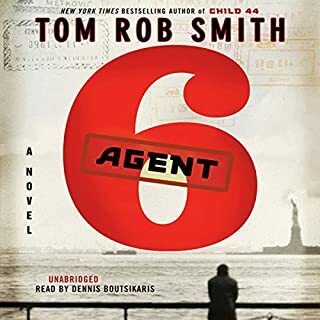 I've previously listened to both "Child 44" and "The Secret Speech" as an audio book, and I'm still incredibly impressed by the originality and imagination of Tom Rob Smith. You honestly never know where you'll end up, and the characters (particularly Leo, of course) are immensely compelling. But I have to admit, a great deal of my enjoyment of all three books was due to the fantastic narration by Dennis Boutsikaris. I personally preferred the plot of the previous two books very slightly to this one, for reasons I won't go into in this review for fear of giving away anything, but I still couldn't rank it as anything but 5 stars for story and overall. The only thing about this audio book that I disliked was the ridiculously intrusive music: despite only occurring (I think) at the very beginning and very end, it took *forever* to fade out at the beginning as the story began (which was merely irritating), but actually *ruined* the final paragraph or so at the very end! Unbelievable. Bitterblue is now queen of Monsea. But the influence of her father, a violent psychopath with mind-altering abilities, lives on. Her advisors, who have run things since Leck died, believe in a forward-thinking plan: Pardon all who committed terrible acts under Leck's reign, and forget anything bad ever happened. But when Bitterblue begins sneaking outside the castle - disguised and alone - to walk the streets of her own city, she starts realizing that the kingdom has been under the 35-year spell of a madman. I like Bitterblue, but have other issues. This book is a continuation of a series, following on from "Graceling" and its prequel "Fire." I was extremely impressed by the way in which the author dealt with the aftermath of the events in Graceling. 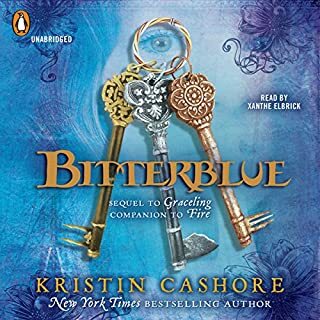 Given what had happened prior to the book's opening, the mysteries and problems discovered by Bitterblue in her fractured kingdom, and her gradual search for answers, all felt very authentic and relevant to things that happen in our world too. Though beautifully written and very entertaining, this isn't a simplistic tale in which a young heroine goes from one adventure to another for their own sake; there's real logic, and also a lot of heart and soul, to this story.